9.We believe all that God has revealed, all that He does now reveal, and we believe that He will yet reveal many great and important things pertaining to the Kingdom of God. raising their families, and individuals are entitled to divine revelation for meeting personal challenges (from the LDS Church website). "The Church of Jesus Christ of Latter-Day Saints accepts four books as Scripture: the Bible,the Book of Mormon, the Doctrine and Covenants, and the Pearl of Great Price. .. The Book of Mormon is a sacred record of some of the people who lived on the American continents between about 2,000 B.C. and A.D. 400. .. "
"..The Doctrine and Covenants is a collection of modern revelations. .. This book contains the revelations regarding the Church of Jesus Christ as it has been restored in these last days .. (explaining) the organization of the Church and (defining) the office of the priesthood and their functions. Other sections .. contain glorious truths which were lost to the world for hundreds of years. 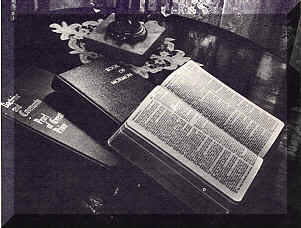 Still others .. shed light on teachings in the Bible (and) .. contain prophecies of things to come." " .. The Pearl of Great Price contains .. (clarification of) doctrines and teachings that were lost from the Bible .. valuable information about the creation, the gospel, the nature of God and the priesthood .. (and ) the doctrine of the redemption of the dead. What do these "scriptures" say? Where did the LDS Church receive them? How did they produce them? Should all God-fearing people who accept the authority of the Christian Scripture also accept these "scriptures" as equally authoritative? The answers to these questions are essential to an informed and balanced understanding of the teachings and practices of the LDS Church, and our articles are now presented for your examination to this end.